Dr. Turetsky graduated with the first class from Tufts University School of Veterinary Medicine in 1983 after receiving his BS in Agriculture and Life Sciences from Cornell University. He began practicing in Boston in companion animal hospitals and later an emergency clinic (as well as a short stint at the Franklin Park Zoo) before moving with his family to East Hampton. He opened The Veterinary Clinic of East Hampton in 1987 and has been enjoying the challenges and rewards of general practice ever since, including getting to know the patients and their humans as the years pass. He is the proud father of Laura and Zev, and he lives in West Hampton with his wife, Wendy, and their two dogs, Chauncey and Ruby. 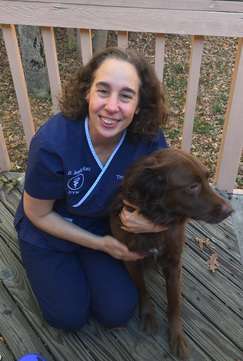 Dr. Katz has been practicing veterinary medicine at The Vet Clinic since the fall of 2001. She graduated from Reed College with a BA in Physics, earned her MS in Applied Physics from Columbia University, and her DVM from Cornell University. Dr. Katz takes a special interest in alternative medicine and veterinary ultrasonography. She incorporates abdominal ultrasonography, echocardiography, acupuncture, cold laser therapy, and Chinese Herbal therapy into her practice. She became certified in veterinary ultrasonography by the International Veterinary Ultrasound Society (www.ivuss.org) in September 2015. She became certified as a veterinary acupuncturist in 2009 by the Chi Institute (www.tcvm.com). She lives in Sag Harbor with her husband, Mike, their dog, Dora, and their cats, Kittoni, Charlotte, and Carter.